We knew the storms were fierce out here in Oklahoma, but I never thought I would see several tornadoes right outside my front door. I took these pictures of tornadoes passing over my neighbor's house. Some of the pictures have several tornadoes passing by in the distance (over Historic Route 66 near Arcadia Lake in Edmond). We're two miles from Historic Route 66 (2nd street in Edmond), which is also where my daughter goes to school (OCS - Oklahoma Christian School). 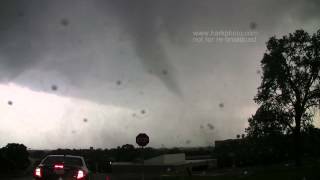 I found this great video by William T. Hark (harkphoto.com) that shows the tornado passing over/nearby OCS and Life Church (the big cross). The last part of the video shows them following the storm as it traveled east. My vantage point is directly underneath the storm as it regenerated into a deadly EF5 that struck towns (Carney) to the east of us. We actually stood under the eerie storm that generated the huge tornado that hit Carney. If you're wondering why I placed these pictures and video in the "Health" section of my website, it is because health means a lot more than physical fitness. This is as good a place as any to point out the need to be "healthy" by planning for emergencies and disasters. A healthy home is a home with a plan. Out here in Oklahoma, tornadoes are fierce and devastating. It's not Hollywood and seeing one on television just doesn't do it justice. If you live in a place where tornadoes occur frequently, you may not have a storm shelter in your house, but you should know where to seek shelter in case disasters like tornadoes come your way. You should know when to seek shelter as well. But instead of regurgitating a bunch of checklists to you, let me just open the discussion by asking this question. Do you have an emergency/disaster readiness plan?